I have another sketch challenge for you! I just can’t get enough of this wonderful Sycamore Street DSP and Madison Avenue stamp set! I just a few more days you will be able to get these items for FREE during Sale-A-Bration! Find out more about Sale-A-Bration on my Promotions page! 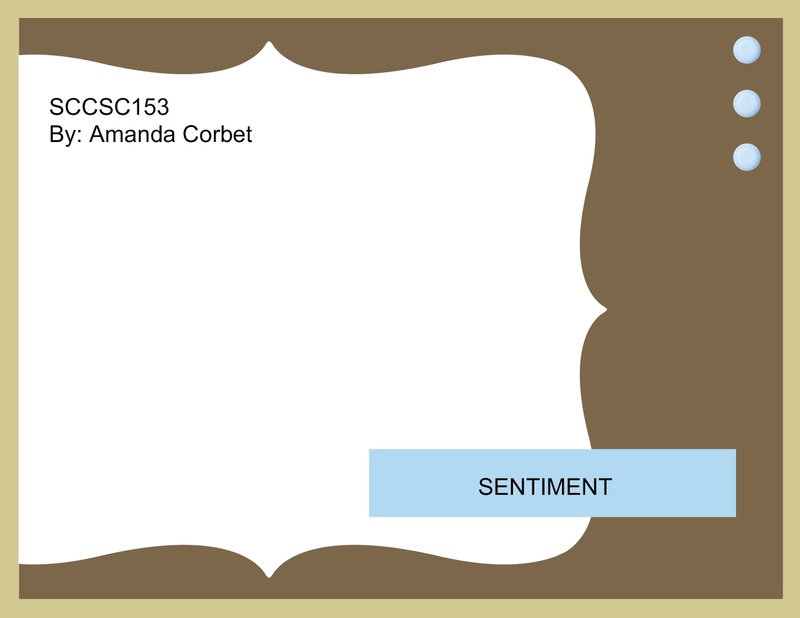 This card was create for SCCSC153 that was designed by yours truly. I started off with a piece of Island Indigo card stock cut at 5-1/2” x 8-1/2” and scored it at 4-1/4”. I cut a piece of Sycamore Street DSP 4” x 5-1/4”. I ran a scrap of Whisper White card stock through the Big Shot with the Label Framelit. Next I stamped the leaves from Madison Avenue onto the Whisper White card stock in Lucky Limeade ink. I made the stems taller by using my Stamp-A-Ma-Jig to line up the stem and stamped it again in Lucky Limeade ink. I used the Lucky Limeade marker to add a line of shadow on each leaf. For the blossoms I stamped the image on two of the stems in Pool Party ink and the center one in Rich Razzleberry ink. I adhered the stamped Whisper White label onto the DSP and then this layer onto the card front. 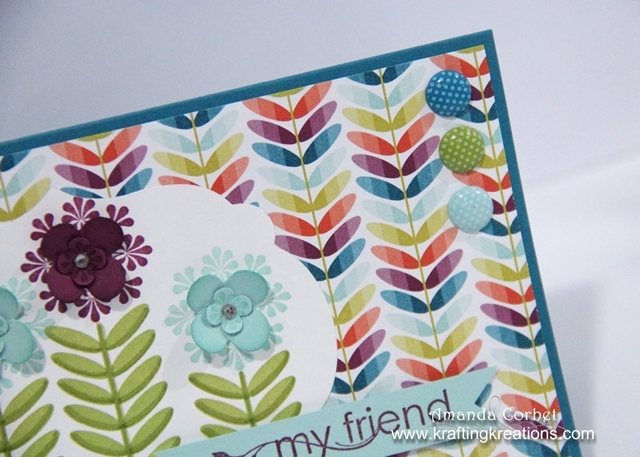 I used my Paper Piercer and Stampin’ Pierce mat to pierce three holes in the upper right hand corner of the card front and added three In Color Designer Printed brads. For the 3D portion of the flowers I ran a scrap of Pool Party and a scrap of Rich Razzleberry card stock through the Big Shot on the Floral Fusion die to cut out the smallest flower on the die. Next I stamped the small center image twice onto Pool Party card stock in Pool Party ink and one onto Rich Razzleberry card stock in Rich Razzleberry ink. 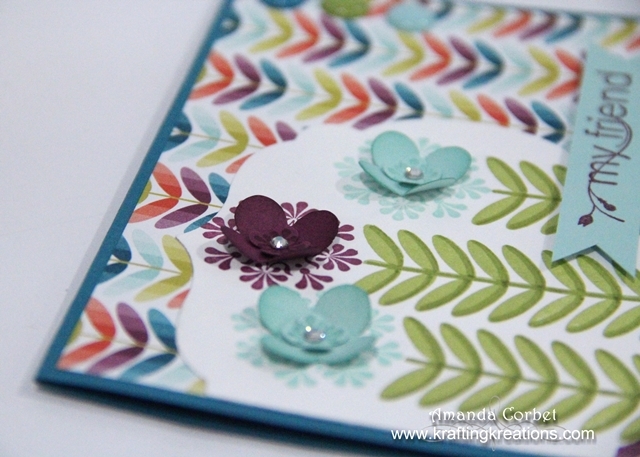 I punched out the small center image with the four petal punch from the Itty Bitty Shapes Punch Pack. I sponged the edges of all the flowers with the coordinating ink then simply bent the petals up and glued them together with some Multipurpose Liquid Adhesive. I used the same glue to adhere the flowers onto the stamped flowers and finally added a small Rhinestone into the center of each flower. The greeting from My Friend was stamped onto a scrap of Pool Party card stock in Rich Razzleberry card stock then I used my Paper Snips to cut a dove-tail in each end and adhered it onto the card front with Stampin’ Dimensionals.